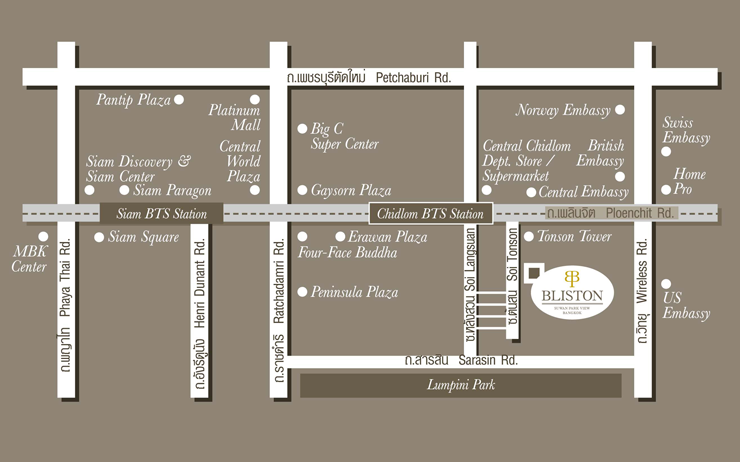 Bliston is ideally located in the heart of Bangkok which is surrounded by main business districts and leading shopping malls. With Chidlom Skytrain station a few steps away, it provides a rapid exploring the delights of Bangkok within easy reach. A cheap way around town with an extensive bus service with routes serving every part of the city. A three-wheeled non-air-conditioned vehicles taking up to 4 passengers at a time, an interesting mode of transportation for short distance trips. Fares should be agreed before getting on and should be relatively cheap.